Sorry that I am almost a week late making this post. I moved over the weekend and that has consumed all of my time!! Congratulations Megan Wheeler. You are the winner of the Phonics Fish Giveaway!! In honor of Constitution Day (September 17th) we learned about the the constitution. 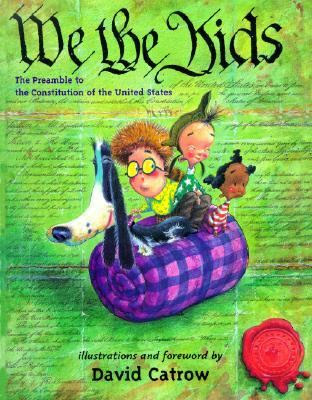 We read the book We the Kids by David Catrow and talked about the words in the preamble and what they mean. Then we made our own "Class Constitution." We talked about the freedoms, rights, and responsibilities we thought we should have in our classroom. Then we took the rules we created and sorted them into categories- rules that keep us safe, rules that show respect for others, and rules that show we are responsible. On the Monday we charted our class constitution. Then I typed up our ideas and cut them into strips so we could sort them. I passed out the rules. 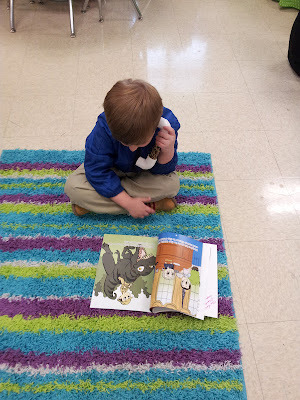 Then we read them together and decided what category they went into and why. We talked about our Founding Fathers and those who framed the Constitution. 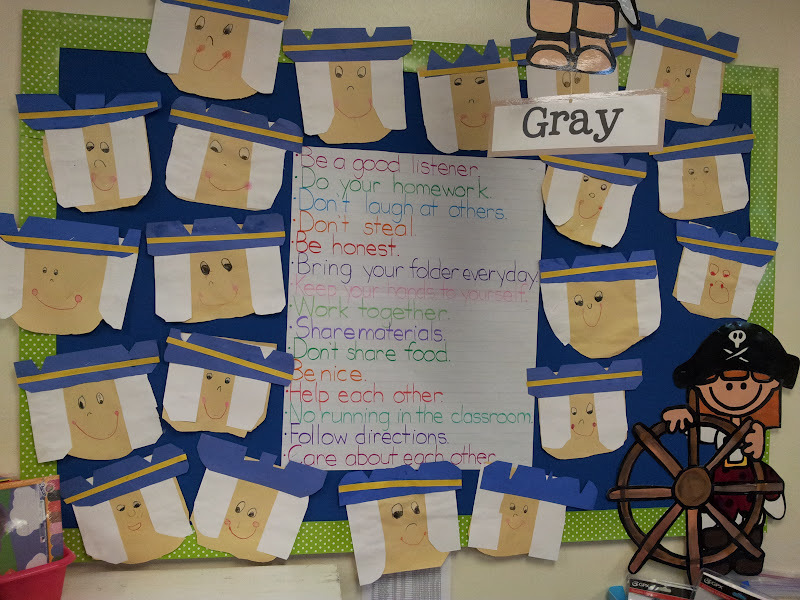 Then we made "Founding Fathers" to go with our Class Constitution. 1) Cut and round the 2 bottom corners of the manila piece. 2) Cut and round 1 bottom corner of both white hair pieces. 3) Glue 1 hair piece on each side of the head. 4) Cut and round the 2 bottom corners of the blue piece. 5) Cut 2 v's out of the top of the hat. 6) Glue on the yellow hat strip. Trim off excess on the sides. 7) When the glue is dry on the faces use crayons to add details. Media literacy is the ability to access, analyze, evaluate, and create media messages of all types. This skill is vital in today's world where so many of us get most of our information through media texts, messages, and sounds. Our students need to be able to understand how all of these messages are created and the hidden meaning they usually hold below the surface. 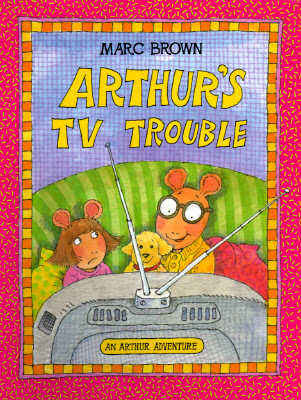 I used the book Arthur's TV Trouble to introduce the concept of media literacy. 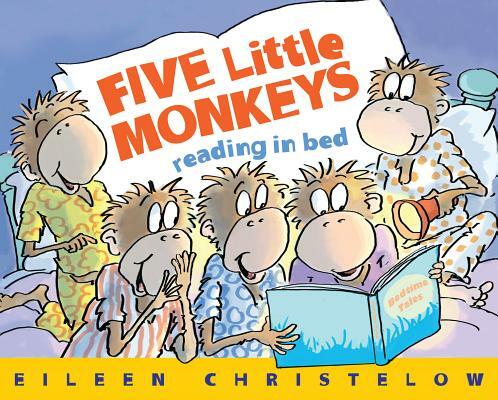 The book is perfect for showing students how media creates a particular message, spin, tools of persuasion, and how to evaluate messages based on our own experiences. 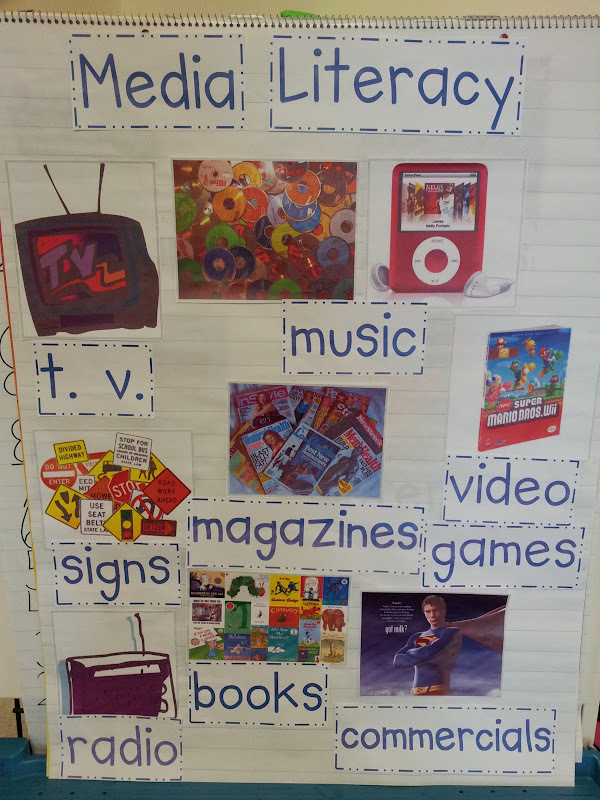 After reading and discussing the book as it related to media literacy we made this anchor chart. We matched pictures to the words and placed them on the chart. 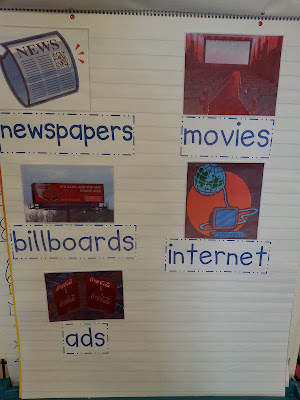 We talked about each form of media and how it works as we added it to the anchor chart. I made my pictures really big so we ran out of room. I downsized them a bit for the download I posted below so hopefully they will all fit now. For more information on teaching media literacy click here. To download the pictures and words for the media literacy chart click here. Thanks again to all who entered!! Happy reading everyone!! 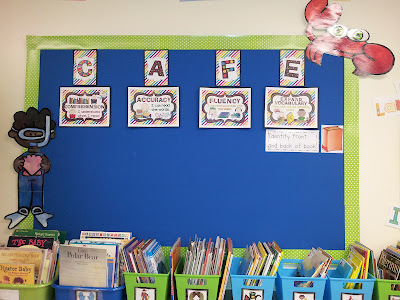 Today I introduced the CAFE board and our first reading strategy. 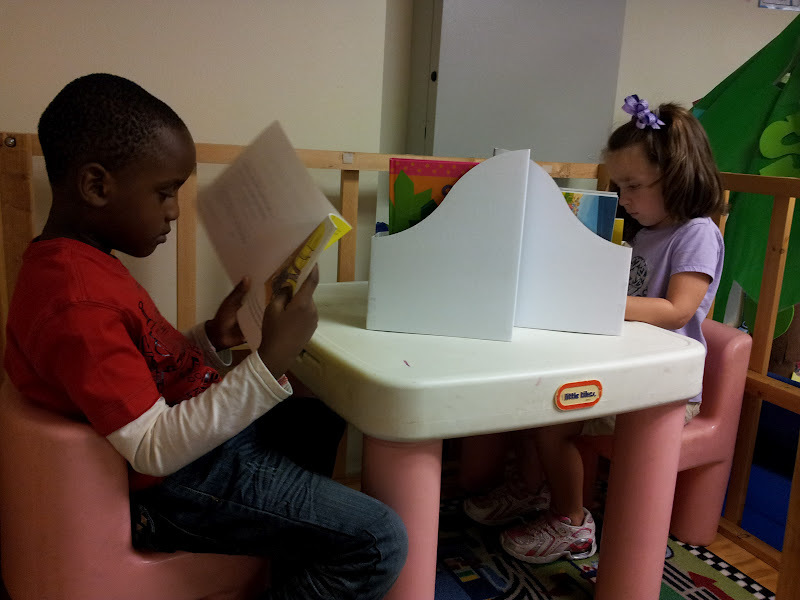 I am using the headings and strategies from the CAFE menu for emergent readers that the sisters have on their site. 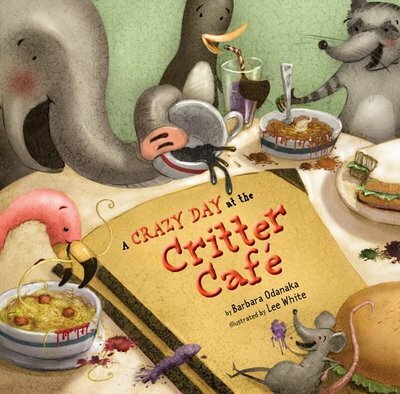 I used the book A Crazy Day at the Critter Cafe to introduce the idea of the CAFE board. We talked about how a Cafe was another word for a restaurant. We also talked about how when we go to restaurants we order our food from a menu. I gave my students the opportunity to share some of their favorite foods that they like to order when they go out. We talked about how menus at some restaurants are on paper but others are on boards on the wall. I explained that our CAFE menu would be that type of board. We talked about how restaurant menus show you foods you can order and the CAFE menu shows you reading strategies you can use. We discussed how when you order at a restaurant you do not order everything on the menu because that would be too much food to eat and it would not all fit on your plate. I related that idea to choosing one or two strategies to try out at time because trying to use too many at once will slow down your reading. We also talked about how we don't always order the same foods at restaurants so we may not always want to use the same strategies to figure out a word. Sometimes we might like a particular food and sometimes we might not. Sometimes one strategy might work for us when another might not. It is important to emphasize that the CAFE menu is the board they will use all year long to remind them of the strategies that all readers use. We will put strategies up on the board that they can look at and try out as they read. Chapter 3 of the CAFE book does a great job of explaining how to introduce the board and the strategies. I chose "identify front and back of book" as the first strategy because we have practiced it a lot. 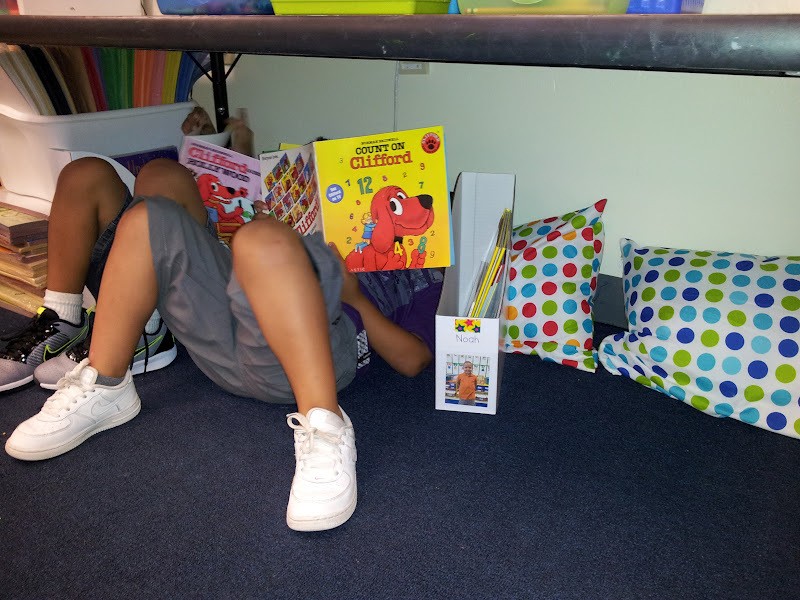 I told my students that this strategy was important because it helps us to start reading in the right place. I did not introduce or explain any of the other headings today. I will focus on this strategy and refer to it on the board for several days before adding a new one. My CAFE signs came from Ginger Snaps. They are not based on the emergent menu though. I am using picture cards to go with each strategy to help out my less advanced readers. You can download the first three strategies I plan to introduce here. I am moving this weekend but plan to make a sign and picture card for each strategy and post them soon. This week we have been learning about our Five Senses. 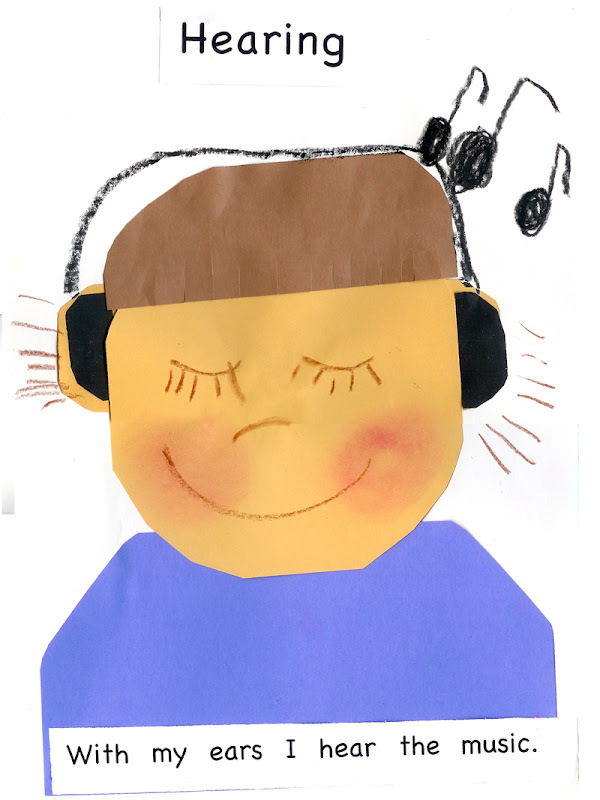 I have been using Caitlin Clabby's Five Senses Unit all week. It is great! 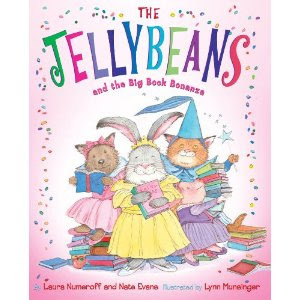 It is full of fun 5 senses activities, class book pages, and recording sheets. 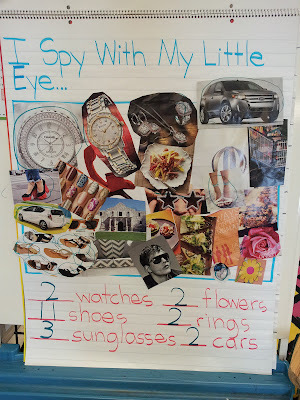 I ran out of time for my kids to do the "I Spy" page individually so I improvised and we made this whole group version. Caitlin's unit has an "I Spy" recording page and a super cute class book cover so that you can put everyone's sheets together and make a class book. Don't forget TLC Lessons newest book The Five Senses too!! Everything TLC is great!! Here is a sample of the hearing lesson from the book. 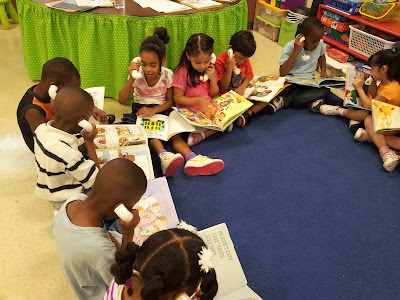 Toward the end of the week I introduced whisper phones to my class. Since we are still trying to build up our stamina and not getting anywhere quickly I decided I wanted to teach my students to use the phones before allowing them to use them during read to self. I modeled how to hold and use a whisper phone while I read a book aloud to them. 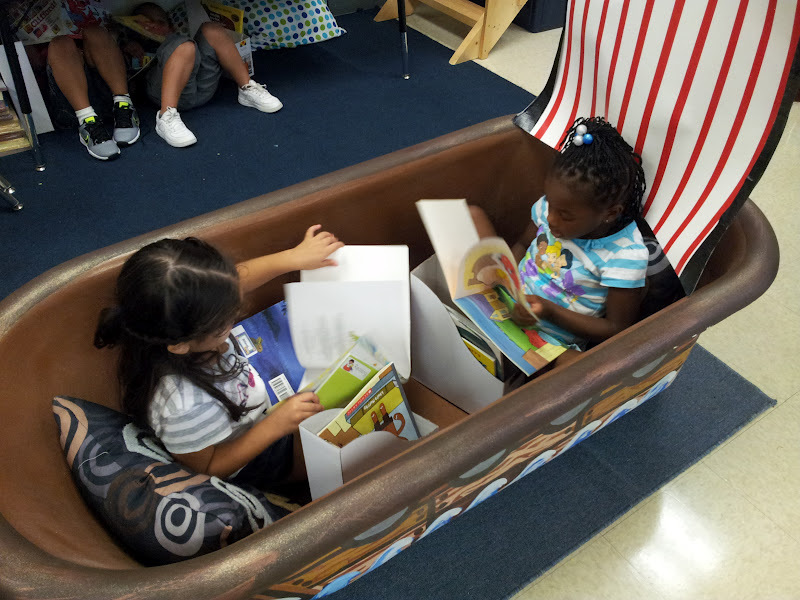 Then I placed books in the middle of the carpet, had each student choose a book, and passed out a whisper phone to each child. 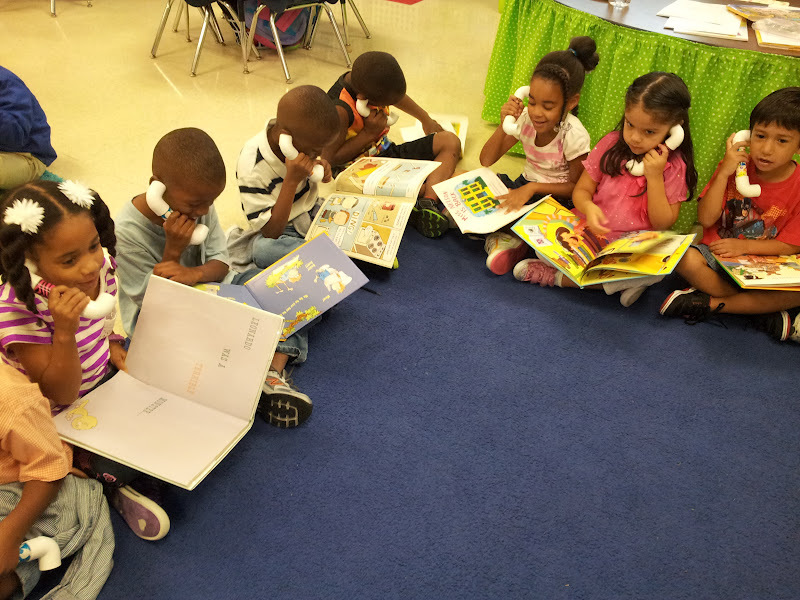 Then I had them read their books using their whisper phones. We did this Thursday and Friday. For the most part everyone is using them correctly now, but some boys still want to blow in them and make noises instead of reading. 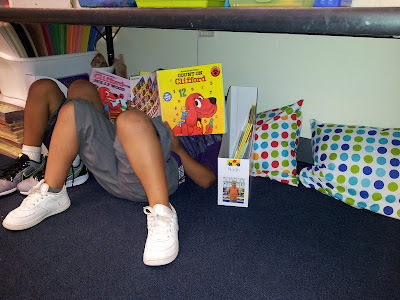 Once everyone can read their book using the phones correctly and we have built up a little stamina I plan to have them keep a phone in their book box and use them during read to self. 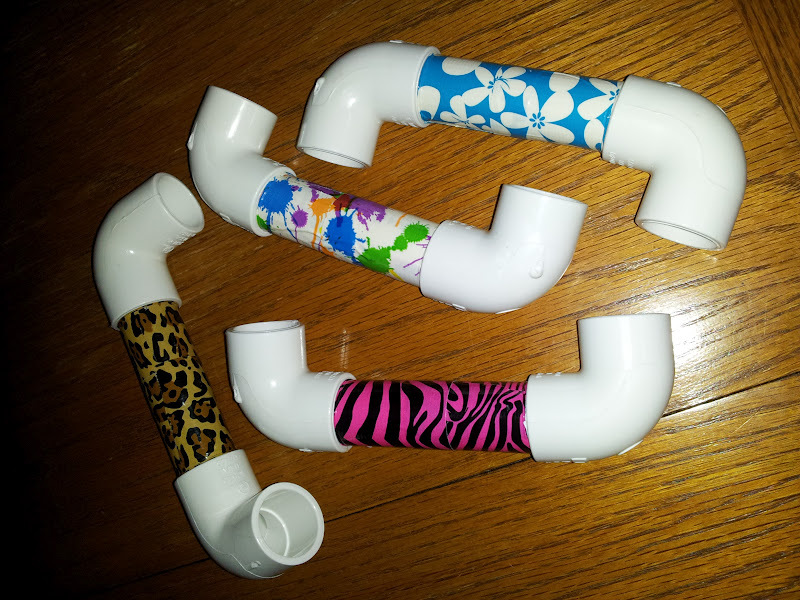 I made my whisper phones with 3/4 inch PVC elbow joints, 3/4 inch PVC pipe, and decorative duct tape. You can purchase a bag with 10 elbow pieces in it from Home Depot. Home Depot will also cut the PVC pipe into pieces for you. I was able to get about 25 pieces cut from one pipe. I used Abby to test out how long I needed the pipe to be cut. Between 4 and 4 1/2 inches is about right. 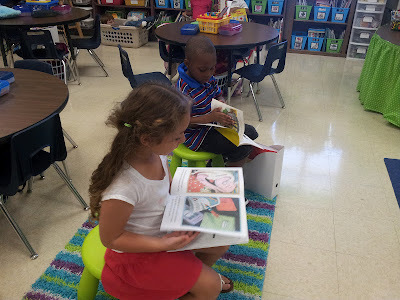 After all of my reading and research this summer I am really making an effort to have my kindergartners reading or listening to reading as much as possible during the day. If you have other times you work in reading during the day leave a comment and let me know. I would love to hear from you. One of the inspirations behind my push to increase the time my students spend reading came from Donalyn Miller better known as The Book Whisperer. Christopher Lehman just made a great (and funny) guest post for her entitled What the Kardashians Taught Me About Reading Instruction (No, For Real). For a good laugh and some great tips on how to brand yourself as a reader check out Christopher's post here. This is a great book to use when creating "a sense of urgency" for your students with the Daily Five. 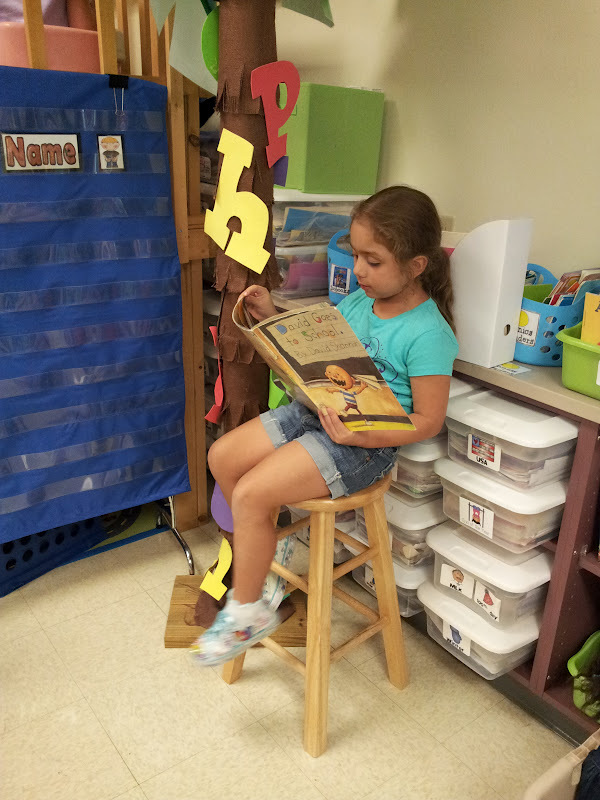 It shows students why it is important to read every day and why we want them to build their reading stamina. 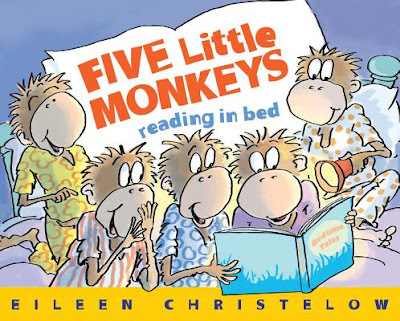 While we are working to build stamina I am starting our daily five time by reading books which promote a love of reading. Here are my favorites! We have been busy all week rocking with Pete in our school shoes. 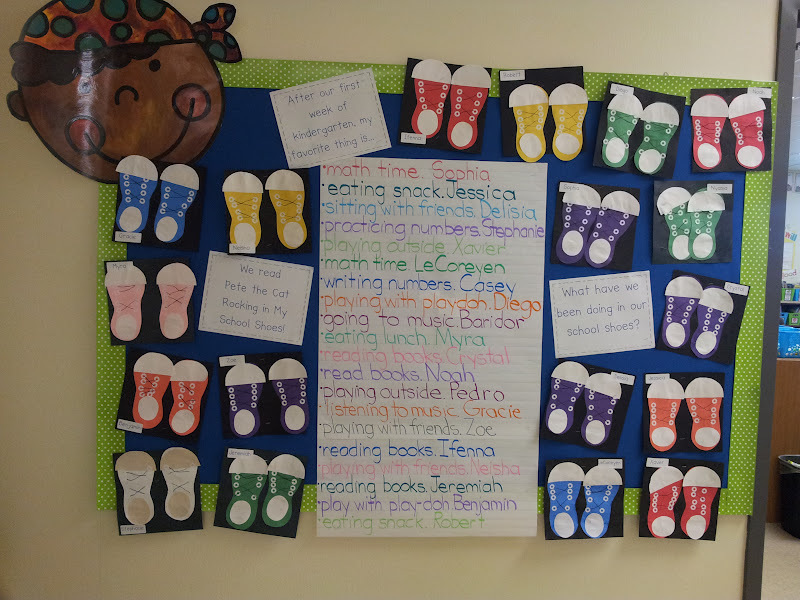 The charting idea came from A Place Called Kindergarten and the shoe craft came from The Bubbly Blonde. I was afraid my class was not quite ready to make Pete the Cat so we started with something smaller. I love the way the shoes turned out. 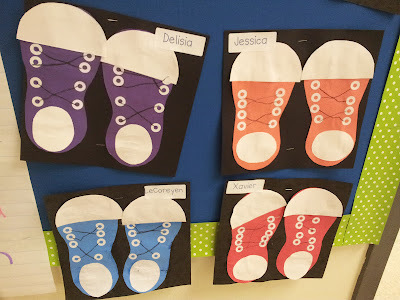 I had my students choose what color of shoes they wanted. They glued down all of their pieces and added the white reinforcer stickers. After the glue was dried they went back and drew in laces. Congratulations Lisa from Learning is Something to Treasure!! You are the winner of the brag tag giveaway!! Thanks again to Boost Promotions for sponsoring the giveaway and to all of you who entered. I have been looking at bucket filling charts, systems, and lessons for the last couple of years. 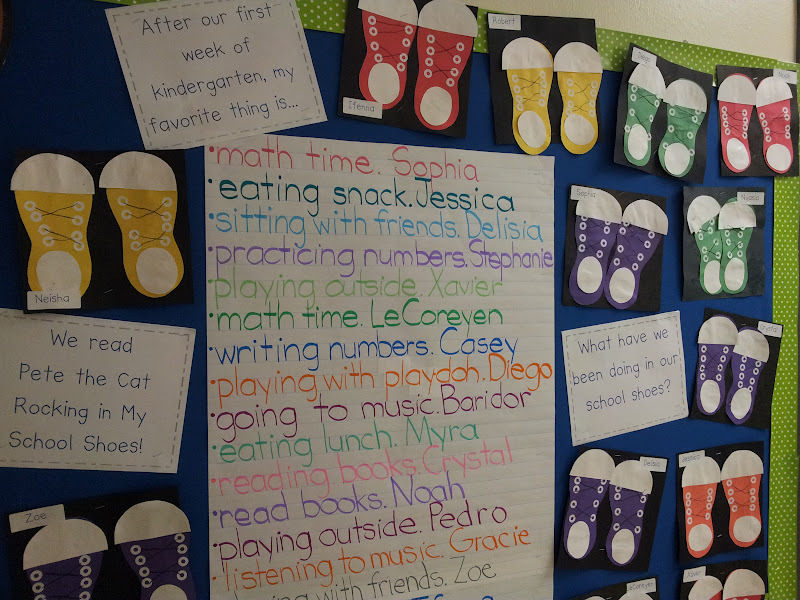 In some cases the ideas overwhelmed me because it seemed like it might be a lot to manage with kindergartners so I had decided against implementing it in my classroom. Over the weekend I reflected on the past week and decided I needed something else to help with talking while I was talking and students putting their hands on each other all the time. I had coffee with a good friend of mine and she told me that "bucket filling" had changed her classroom. 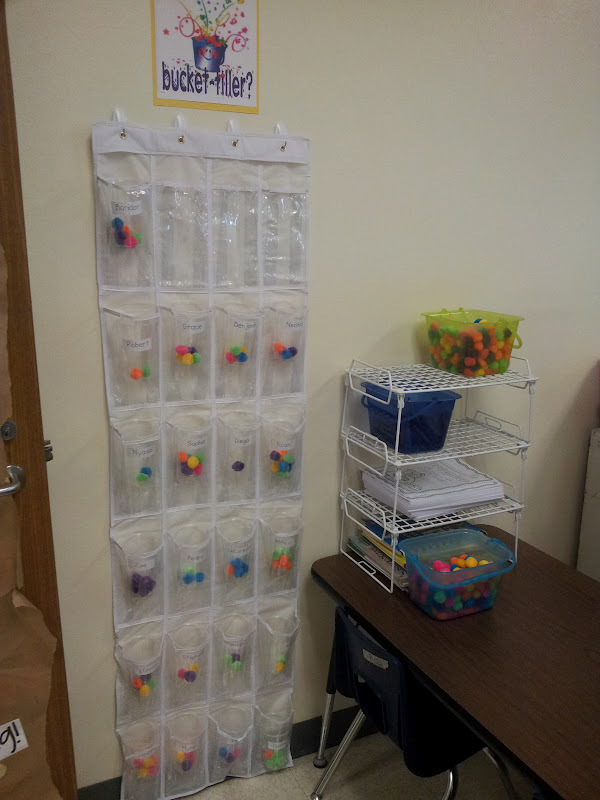 With some advice from her this is how I set it up and started using it in my classroom. After only one day I am very happy with the results. I bought a shoe rack, clear plastic cups, and pom pom balls. 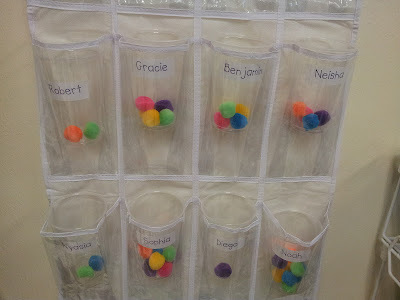 I went with clear cups so my students could watch their progress as they filled their buckets. I also wanted to be able to do a quick check on how everyone was doing without having to walk over and look in everyone's bucket. I used command hooks to hang the show rack. I chose the ones that can hold about 3 lbs. 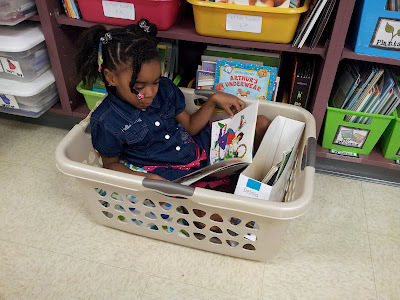 I introduced the buckets with the book Have You Filled a Bucket Today? We discussed what it meant to fill a bucket and dip from a bucket. I related our class rules of following directions and being a good listener to filling my bucket. I talked about how it made me feel good as their teacher when they listened and followed directions, and wanted to learn what I was teaching them. I explained that we would take a few minutes each day for people to share how someone filled their bucket that day and that the "bucket filling" child would get to add a pom-pom to his or her bucket. I also explained that I would call on people to add pom-poms to their buckets throughout the day when I say them filling someone's bucket or when they filled my own bucket. I also explained that there would be times when they would be working at their tables and I would pass out a pom-pom to everyone and the students who followed directions would get to keep their pom-pom and add it to their bucket while the students who did not follow directions would lose their pom-pom and not be able to add it to their bucket. I like the idea of them never actually earning the pom-pom for a bad choice rather than taking away a pom-pom they earned from making a good choice. In most cases it is the child's responsibility to add the pom-pom to their bucket. Other times if I was closer to the buckets or if I wanted to give the entire class a pom-pom quickly then I added the pom-poms myself. The day went so much better for me using this system. This was great for those students who have trouble making good choices all day long. They were still able to get rewarded for the good choices they made. When they fill their buckets they will get a coupon for something fun like working in their socks or bringing a stuffed animal to work with during the day. I plan to very the reward periodically so they will not loose interest. It will always be something like a coupon or certificate as opposed to a treasure box toy. We made it to 2 minutes and 30 seconds of stamina today!! At least that is an improvement for our 30 seconds on Friday. I started by reviewing Dex from last week and how he built exercising stamina. 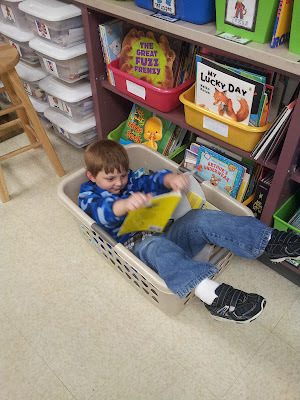 Then I reminded students we were trying to build reading stamina. 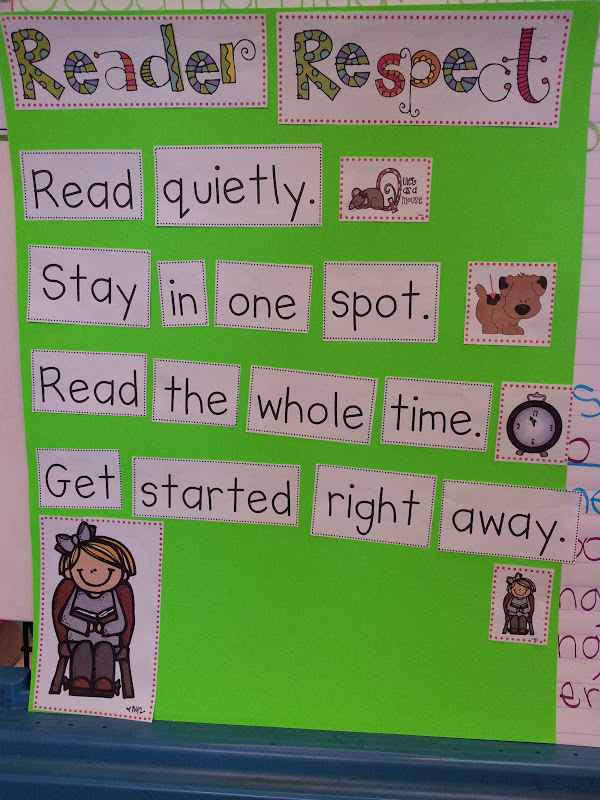 They did a great job of remembering what they were supposed to be doing during read to self, why there were doing it, and their class stamina goal. 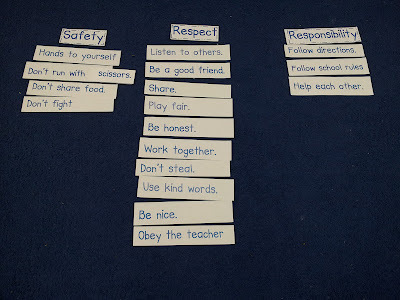 We reviewed all of the respectful reading behaviors from the anchor chart we made last week. We discussed the ways people broke stamina last week and talked about what we would do differently today. 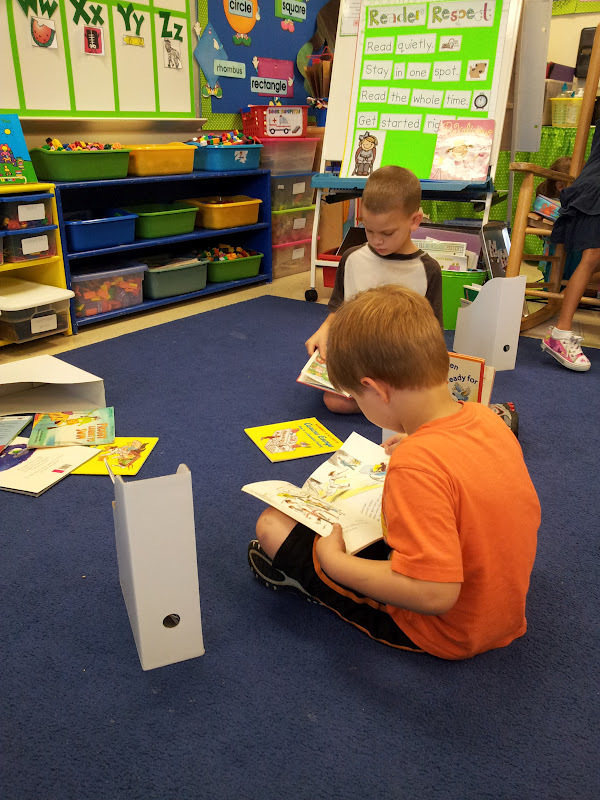 Then I sent them off to read! During read to self I read a book too. I sit at my table and read and try to nonchalantly keep an eye on everyone. I am always watching for that "barometer child". I do not let the kids know I am watching them. I do not give anyone the "teacher look" or an "evil eye." If I see someone breaking one of the respectful reader rules then I tap my wand, have them put their boxes away, and call everyone back to the carpet for check in and discussion. 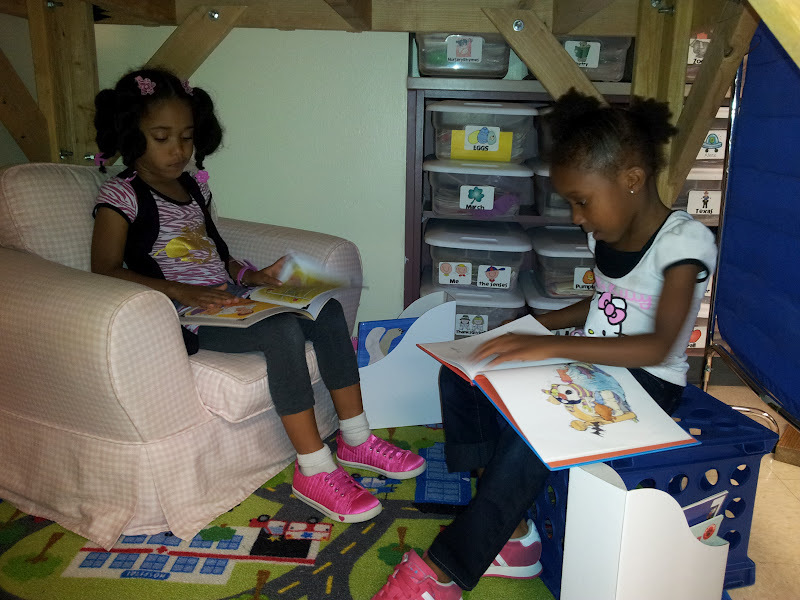 The sisters say not to micro-manage your kids during read to self. They say they tried that one year and when they tried to release responsibility the kids had a hard time working independently because they were not used to working unsupervised. I have been strict in enforcing the read to self behaviors because I want my students to know what I expect from them. 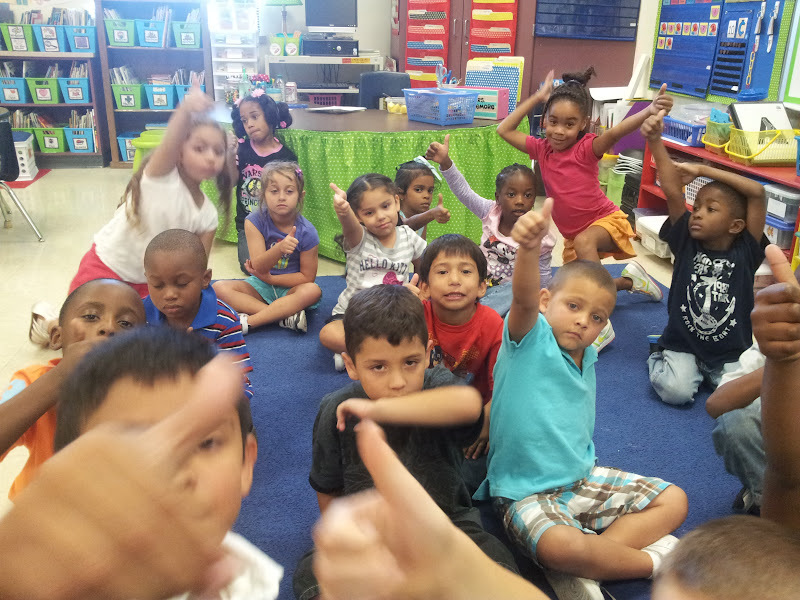 Last Friday when we officially started to build stamina I introduced checking in with hand signals. It worked really well. The students who broke stamina for us were honest with their thumb signals. From the videos I watch the sisters say to use "thumbs up" and "thumbs sideways" rather than "thumbs down." Here is the stamina chart I created. I wanted it to be easy for my little ones to see and read so I made it on chart paper. Tomorrow's agenda consists of continuing to try and build up to our short term goal of 3 minutes of reading stamina and to talk about creating "a sense of urgency"- why it is important for us to read to self. The best way to become a better reader is to practice each day and it’s Fun! 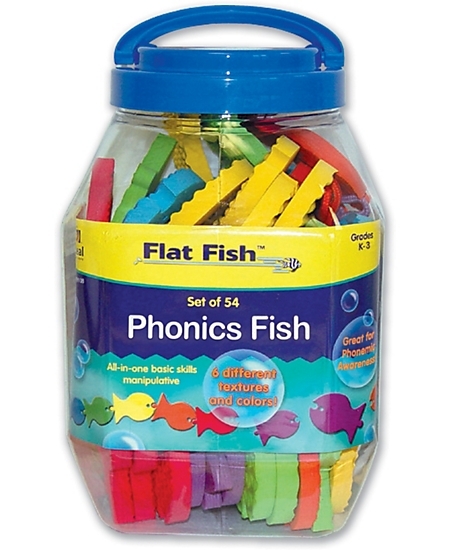 I used these fun Phonics Fish from Carson-Dellosa and my kids LOVED them!! 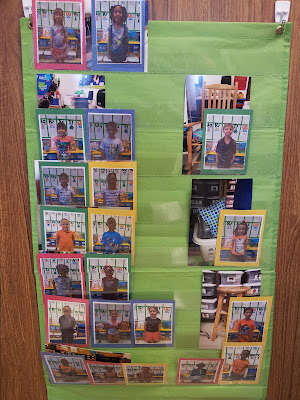 Since it is the beginning of the year we used them for an ABC version of "I Have, Who Has" and we put them in alphabetical order. 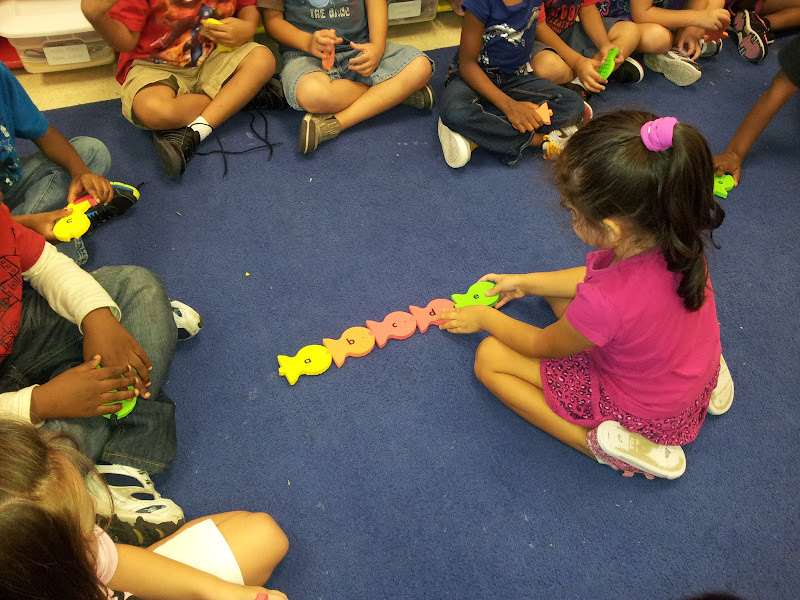 I am most excited about using these fish as one of my activities for word work in daily five. What a fun manipulative to make words with. 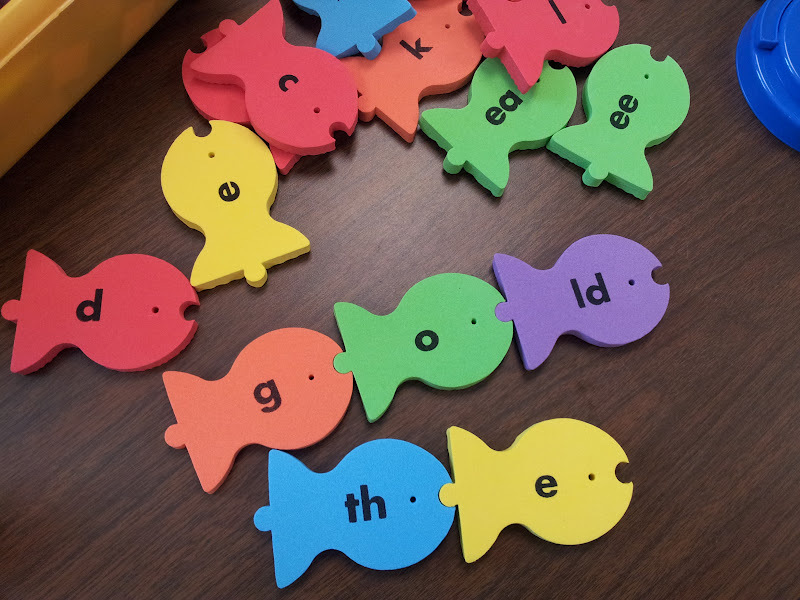 The set comes with multiple copies of the vowels, vowel digraphs, and blends so they can be used throughout the entire school year. They are a good size for little hands, easy to join together, and come in bright fun colors! They can be used in word work with the daily five or in several different literacy stations. You can use the fish for sorts, alphabetizing, making words, and games. 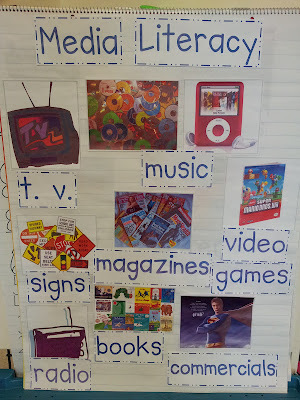 We are going to make our sight words with them each week in whole group while we are building stamina in read to self so that my kids will be familiar with them once I introduce the word work rotation. 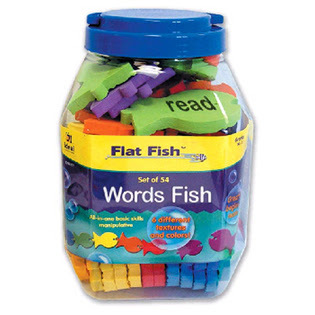 You can also get the fish with words on them so students can build sentences and do sorts. 4) Leave a comment about the giveaway with your email address in it. You can leave a separate comment for each requirement. The giveaway ends Wednesday, September 19th at midnight. Good luck everyone!! My kids had so much fun with these!! Giveaway: Do You Know Where the Bus Driver Will Go? This post is dedicated to my dad.... who after spending more than 30 years in the corporate world became a a school bus driver. Thank you dad for all you do for me. I love you! My dad... along with a few of his grandchildren. 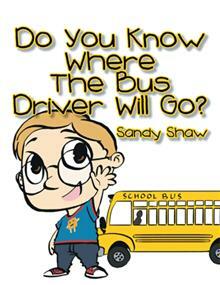 I recently learned about Sandy Shaw, a kindergarten teacher in Pennsylvania, and her new book Do You Know Where the Bus Driver Will Go? When I read this book for the first time I fell in love with it. The book is not too wordy so it is perfect for young children and I could just visualize my kids laughing at all of the things the bus driver might do after he dropped the kids off at school. I immediately thought of extending the story through shared and creative writing or with a class book. This book is perfect for a unit on careers or community helpers or for a back to school study of the people that help us at school. And of course the book caught my attention because it reminded me of my dad. In the book, the little boy thinks of all of these things he thinks the bus driver might do including going to the White House and serving dinner to the President, going to the county fair and winning a blue ribbon for the best pig, surfing the biggest wave in Hawaii, and performing at a rock concert with his cool rock band. These are just a few of his thoughts. The others are just as funny. 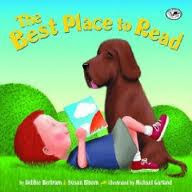 I read the book to my students this morning and they loved it. 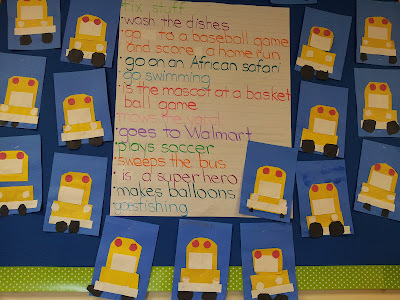 Since it is so early in the year for us we brainstormed a list together of other things the bus driver could do after he dropped the students at school. We also made a bus craft instead of illustrating our ideas. If it had been later in the school year or my students were older I would have had them do their own writing and drawings and created a class book. Another extension would be to take another community or school helper and brainstorm what he/she does when they get off of work. 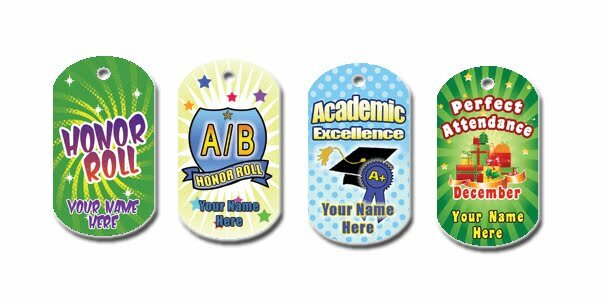 For example: What does the principal do when he/she sends the last student home at the end of the day? Here is the list we made. (I still need to finish putting up the rest of the buses and the signs that tell what we read and what we did.) My favorite idea is that he goes to a baseball game and scores a home run. This chart generated a fun discussion about what my dad does when he gets done dropping off the kids on his bus. That is where fixes stuff, does the dishes, mows the yard, and goes fishing came from. 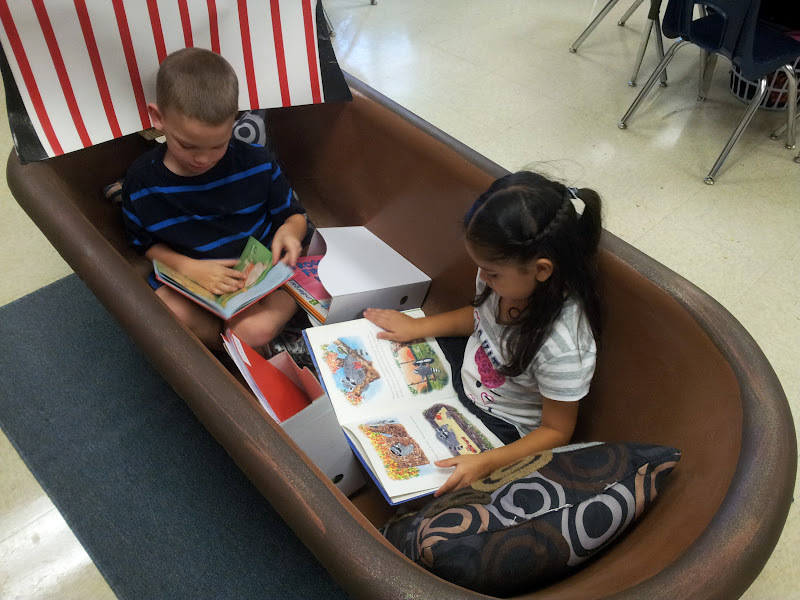 The bus craft came from the TLC Lessons Prekindergarten Book (September-December). 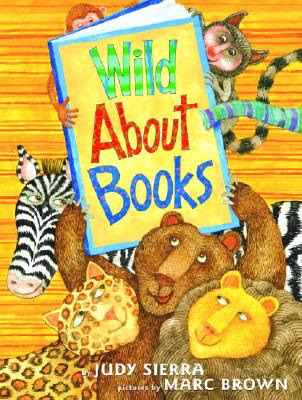 On top of the great fun my class and I had with this book, I am excited to share that Sandy gave me 3 copies to give away!!! 2) Leave a comment about the book or a way you could use it with your students. You can leave a separate comment for each requirement. Don't forget to leave your email. Three winners will be chosen through a random drawing. The giveaway ends Sunday September 16, 2012 at midnight. The book is currently for sale through Xlibris and will soon be available through Amazon. 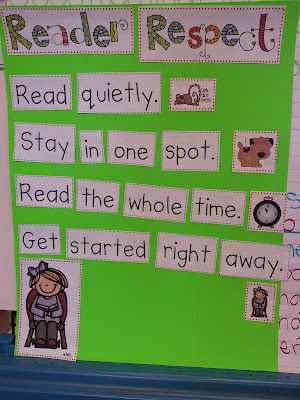 Yesterday we made the anchor chart for respectful reading behaviors. 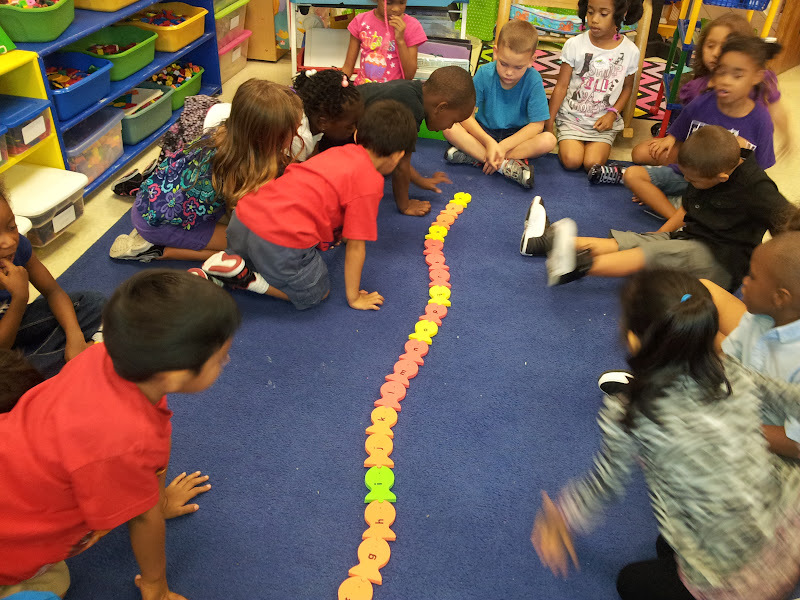 We talked about what each one meant and what it looked like. 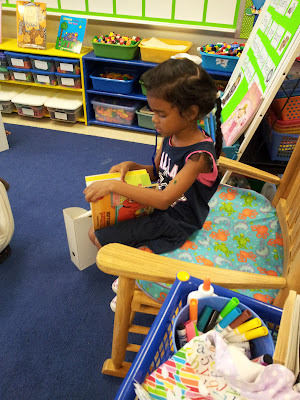 We talked about how I would also be reading during this time and following the Reader Respect chart. Then we practiced it with our book boxes. This was the first day my students used their own book boxes so I called them one at a time, handed them their book box and sent them to a specific place in the room to read. This worked great and everyone stayed on task and followed the Reader Respect rules. 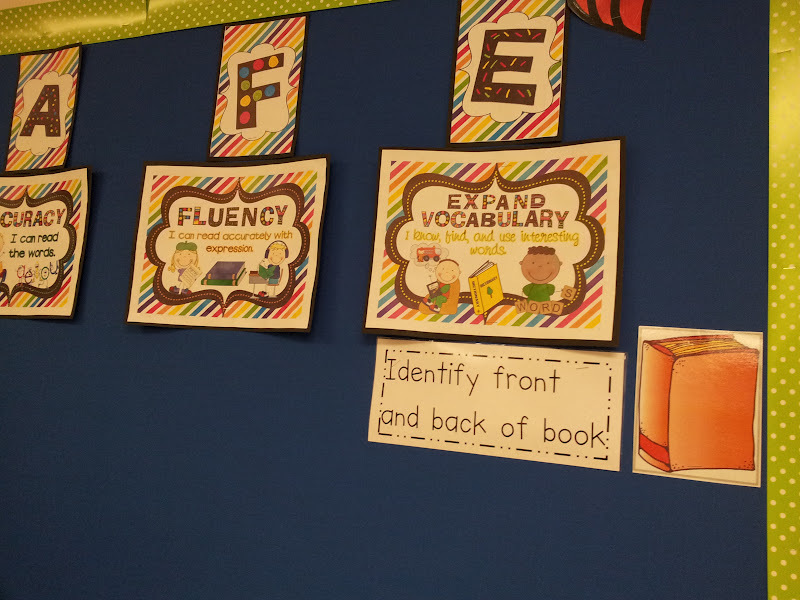 This anchor chart came from one of Kim Adsit's reader's workshop units. 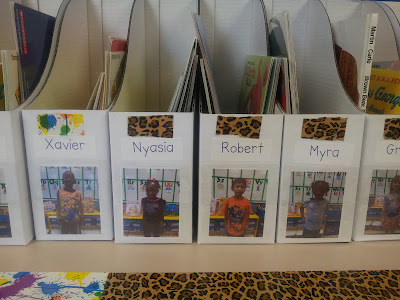 When we were finished reading I showed students how to match the tape on their box to the tape on the shelf and put their boxes away quickly. 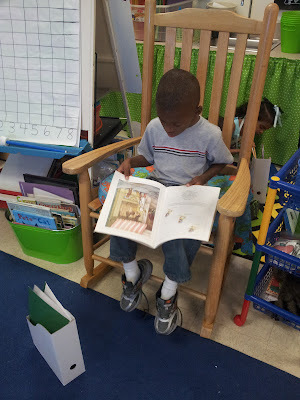 Today we finally started building reading stamina. I found this great launch idea from Erica at Sprinkles to Kindergarten! 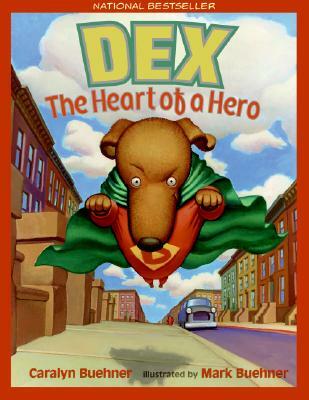 I introduced reading stamina with the book Dex The Heart of a Hero. Dex works to build up his exercising stamina so that he can be a super hero. He researches and trains and gradually gets stronger and able to do more things. 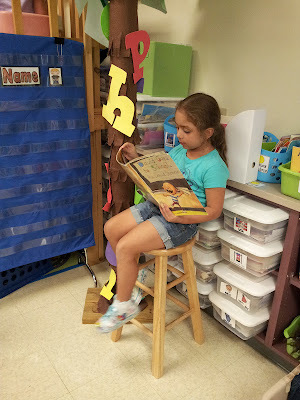 I explained that we would do the same thing to build our reading stamina. We would train and practice and add a little more time each day. I explained we would have to start small like Dex and work up to our goal of 15 minutes. I did not introduce the stamina chart today because we spent so much time on the story and what building stamina meant. I plan to introduce it tomorrow. 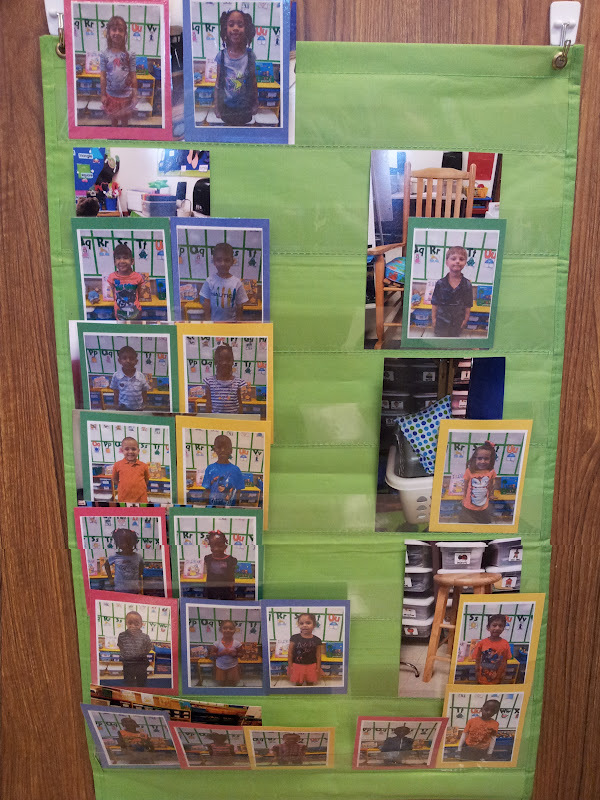 I also introduced my "book nook" chart. Since I feel so crunched for time these days I went with simple. 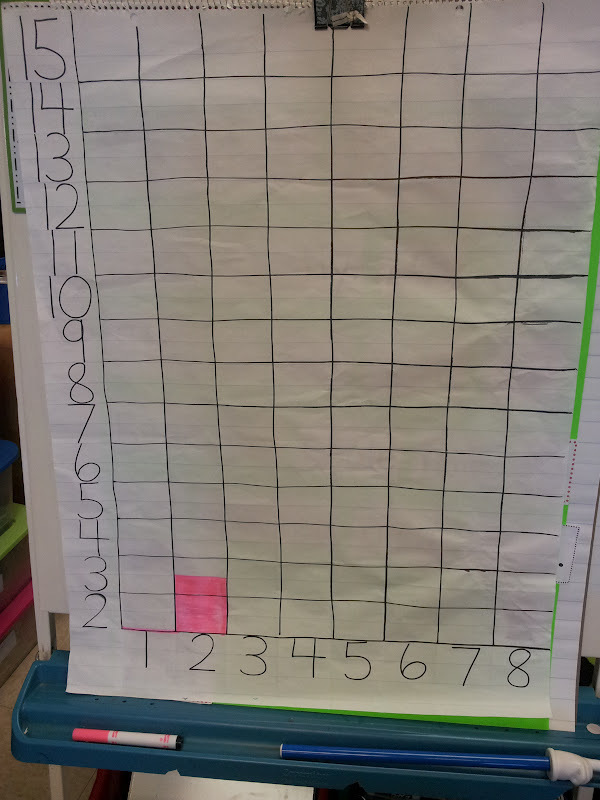 I will only use this chart for a short time while we are learning where we can read in the room and how to read there. Once students are familiar with the reading seating and how many students are allowed there I will let them choose their spots freely. I took pictures of all of my reading areas. 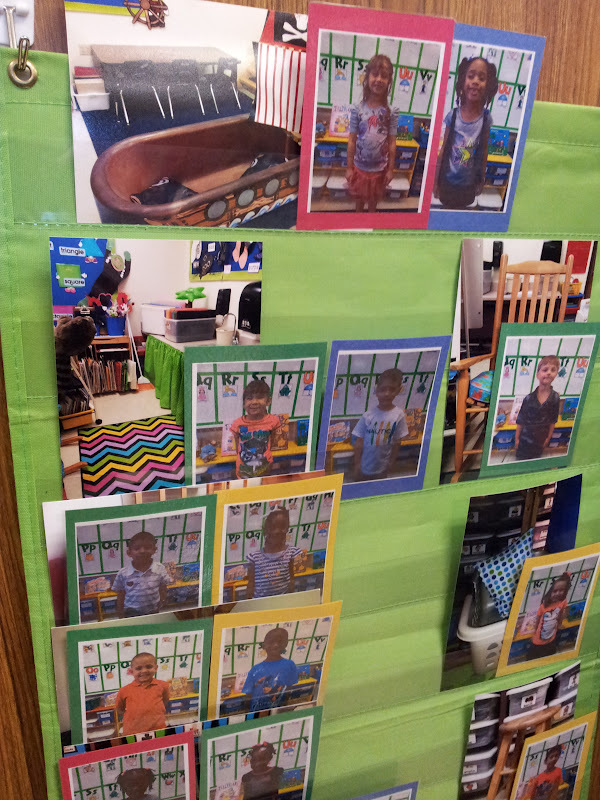 Then I made small wallet sized prints of all of my students. 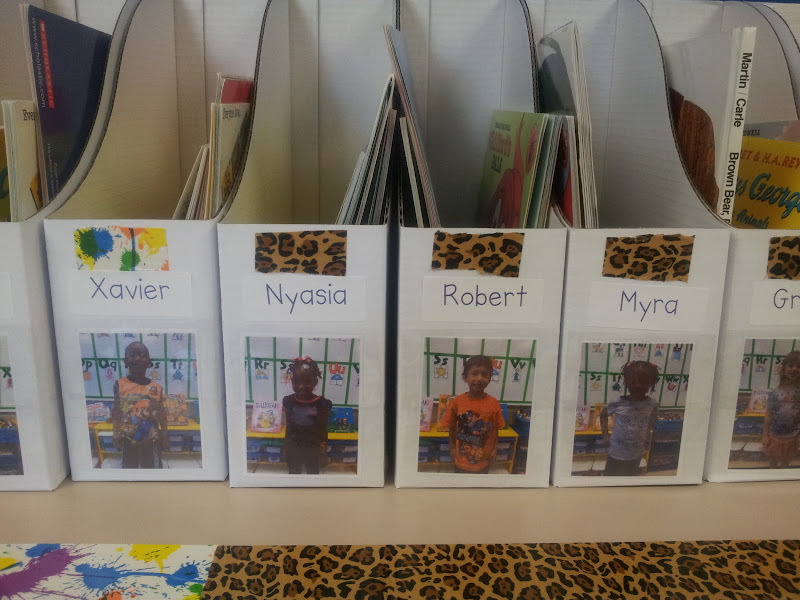 I placed each child's picture over the photograph for where they were to go and read. I called out where they were going and had them pick up their book box on the way. I like the idea of this chart because it ensures that everyone gets to read in all the spaces around the room and I do not have to remember who went where each day. In this picture you will notice books all over the floor. 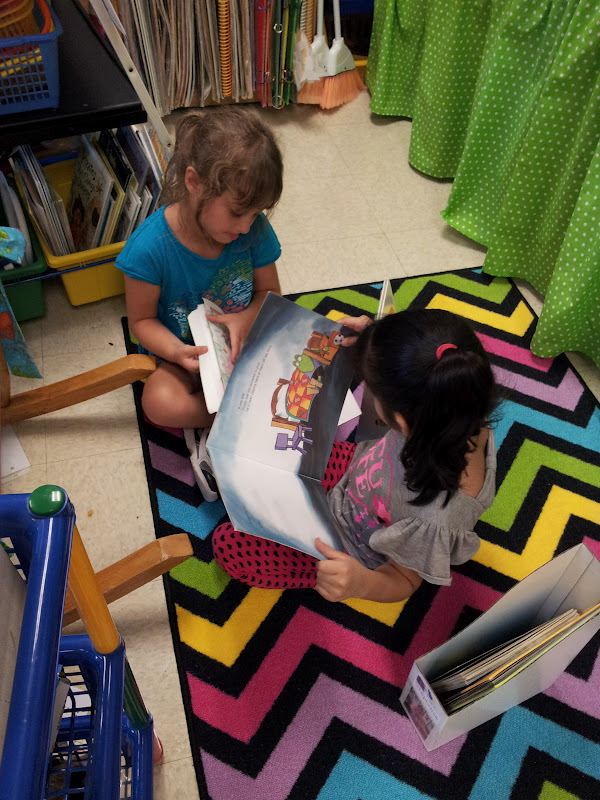 We did have to talk about being a "Book Bully" again and what could happen to our books if we left them all over the floor. A+ Images Bling Tee Winner! A+ Images Classroom Faces T-shirts Winner!! !